Wall Street traders have found a way to profit from almost every part of our lives including our housing, healthcare, education, and even our water. It’s sneaky and most people don’t even realize it’s happening. Wall Street’s pursuit of profit at any cost has taken over our economy, enriching the wealthy few while the rest of us have to get by with less and less. Wages are stagnant, public services have been cut, and the average American is carrying more debt than ever. Experts have a term for the way Wall Street’s skewed priorities have affected every part of our lives: financialization. Financialization runs deep and affects all of our communities, especially communities of color. We have the power to make our economy work for everyone, but to do that we need more people to understand how we have gotten to this point. 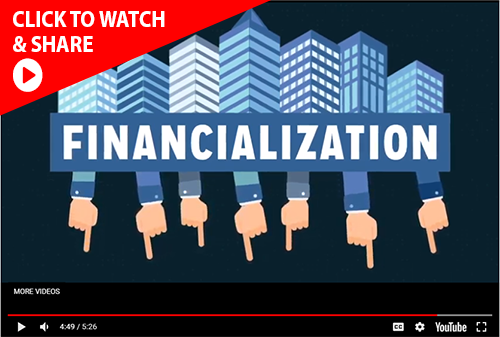 Check out this video that explains financialization in detail and then share it to spread the word. It’s up to people like you who have taken action and shown your commitment to taking on Wall Street to help educate others on this issue. You can also watch the video on Youtube and on Facebook. This problem isn’t going away unless we do something about it, and, the fact is, the people that hold the most power in our economy are benefiting from this system and don’t want it to change. But we have a plan. Thanks to people like you who have been raising your voices for change, more and more national, state and local elected officials are making reigning in Wall Street and returning power to working families a top priority. Thank you for getting involved. We’ll keep you informed about ways to keep taking action in this fight.